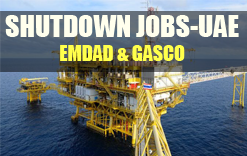 GASCO: Abu Dhabi Gas Industries Limited is a natural gas producing company of Abu Dhabi, UAE. It is a subsidiary of the Abu Dhabi National Oil Company, which owns 68 percent stake in the company. Other shareholders are Shell Abu Dhabi, Total SA and Partex. GASCO is an ADNOC Operating Company engaged in the extraction of Natural Gas Liquids (NGL) from associated and non-associated gas. We play a strategic role in the UAE’s hydrocarbon chain and are a vital enabler of industrial and economic progress. Other industries in this highly integrated chain include on and off shore oil production, petrochemicals, refining, fertilizers, water and electricity agencies and infrastructure industries such as steel, cement and aluminum smelting. From our modest beginnings we have grown to be a major contributor to the UAE’s and Abu Dhabi’s rapidly growing and diversifying economy. As we deliver on our responsibility as the major supplier of gas and related products, we literally keep the wheels of the Abu Dhabi economy going. EMDAD: A long established corporate entity based in Abu Dhabi with diverse divisions and interests, stands EMDAD, formerly Al Bawardi, which since its inception in 1979 has kept pace with steady development that defined the industrial landscape of the region. By utilizing own resources as well as integrating partner capabilities, EMDAD has enabled Abu Dhabi's key energy players to achieve higher level of reliability, and performance. Final Interview with client will conduct soon. Experience: Candidates should have experience in Oil & Gas, Petrochemical, Chemical and Refineries. Candidates Walk in with Original Valid Passport, Updated CV & Latest Photographs.